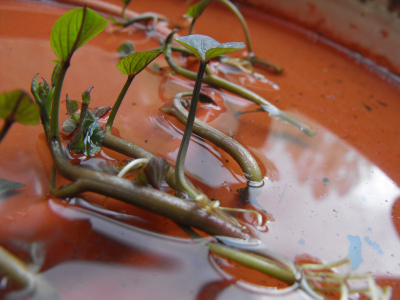 Assuming that the seed roots were not subjected to flooding in the previous production cycle, adventitious sprouts should appear when the temperatures are around 80-85F for at least 2 weeks, relative humidity is above 60%, and that the whole root is not submerged in water. These roots need to "breathe." Seed roots can be "preheated" (80F for about a week, >60% RH) in place prior to bedding. This should shorten the number of days between actual bedding and the appearance of sprouts. Good reminder about the pre-heat. 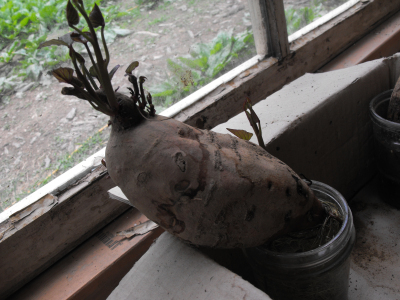 I'm slated to start some more sweet potatoes shortly, and I think I'm going to set them in the warm spot by the incubator for a week to see if preheating will help this year.